Accurate and economical ACR Acrylic Flow Meters are equipped with one interchangeable direct reading scale for helium. Constructed of clear acrylic, interchangeable scales for routine gases and easy reading English or metric scales, meters are available with or without a valve. 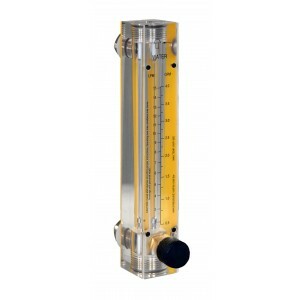 Available for multiple flow rates, this Acrylic Flow Meter has a Dual Direct Reading Scale with yellow backing for easy viewing of Helium flow values. Viton Seals, 1/8" FNPT and Brass End fittings are standard. The float material varies based on the metering range (316 SS, Carboloy, Glass). Available for metering flow rates from 2.0 LPM (4.0 SCFH) to 110 LPM (250 SCFH). 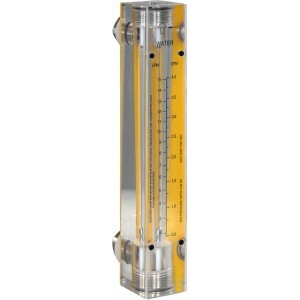 Available for multiple flow rates, this Acrylic Flow Meter has a Dual Direct Reading Scale with yellow backing for easy viewing of Helium flow values. Viton Seals, 1/8" FNPT and Stainless Steel fittings are standard. The float material varies based on the metering range (316 SS, Carboloy, Glass). Available for metering flow rates from 2.0 LPM (4.0 SCFH) to 110 LPM (250 SCFH). 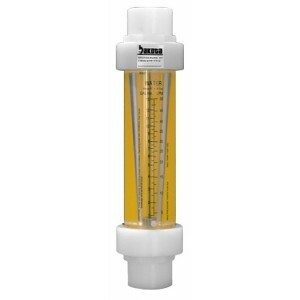 This Acrylic Flow Meter has a Dual Direct Reading Scale with yellow backing for easy viewing of Helium flow values. Viton® Seals, 3/8" FNPT and Brass End fittings are standard. The float/guide material is 316 Stainless Steel. This Flow Meter is designed for panel mounting and can handle a Maximum Flow Rate of 1500 LPM (55 SCFM). No Valve. This Acrylic Flow Meter with Valve has a Dual Direct Reading Scale with yellow backing for easy viewing of Helium flow values. Viton® Seals, 3/8" FNPT and Brass End fittings are standard. The float/guide material is 316 Stainless Steel. This Flow Meter is designed for panel mounting and can handle a Maximum Flow Rate of 1500 LPM (55 SCFM). 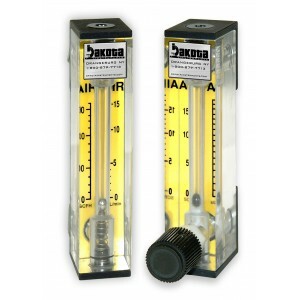 This Acrylic Flowmeter has a Dual Direct Reading Scale with yellow backing for easy viewing of Helium flow values. Viton® Seals, 3/4" FNPT and Polypropylene End fittings are standard. The float/guide material is 316 Stainless Steel. This Flowmeter is designed for inline mounting and can handle a Maximum Flow Rate of 5000 LPM (170 SCFM). No Valve. 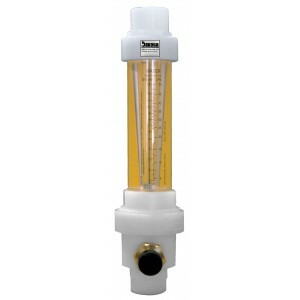 This Acrylic Flowmeter with Valve has a Dual Direct Reading Scale with yellow backing for easy viewing of Helium flow values. Viton® Seals, 3/4" FNPT and Polypropylene End fittings are standard. The float/guide material is 316 Stainless Steel. This Flowmeter is designed for inline mounting and can handle a Maximum Flow Rate of 5000 LPM (170 SCFM).